TEXT: Colbert, Don, M.D., The Seven Pillars of Health. Lake Mary: Siloam Publishers, 2007. Lee University is a coeducational Christian university whose basic purpose is to provide in a Christian environment learning experiences designed to develop within its students the knowledge, appreciation, understanding, ability, and skill which will prepare them for responsible living in the modern world. A personal commitment to Jesus Christ as Lord and Savior is the controlling perspective from which the educational enterprise is undertaken. Education in this environment and from this perspective is viewed as an integration of truth as revealed in the Holy Scriptures and truth as investigated and discovered in the Arts and Sciences. "My main objective for this course is to provide a comprehensive look into the numerous components of fitness and wellness. By course end, students will have a resource notebook filled with invaluable material that will significantly strengthen their professional development and career. It is also my challenge to motivate us to manage this knowledge into a lifelong lifestyle. I have spent many hours collecting data and interesting facts regarding health, fitness, and wellness. I will clip along integrating information with practical assignments along with spiritual implementations, and hands-on experiences such as student-led fitness days and nutrition journaling. I believe the design of this course will assist us in living a more balanced quality of life. One thing is certain: We can all improve!" This course is designed to provide students with a comprehensive introduction to the assessment and development of physical fitness, with emphasis on both personal application and group leadership. Three hours credit. I. PURPOSE STATEMENT This course will provide the opportunity for students to examine problems, issues, and trends in physical activity, testing, and conditioning for physical fitness. Students will also be exposed to the benefits and precautions of physical activity. 1. Provide a basis from which to understand the health related components of physical fitness/wellness to include cardiorespiratory fitness, endurance, flexibility, and muscular strength. 2. Introduce students to the physical fitness variables of diet, body composition and stress management. 3. Introduce students to the sports related components of physical fitness/wellness to include agility, balance, speed, power, and coordination. 4. Extend students’ awareness of movement skill progression from the simple to the complex. 5. Increase students’ understanding of the structure and function of the human body. 6. Stimulate students’ awareness of safety and proper use of fitness/wellness apparatus. 7. Broaden the students’ perspective of physical fitness/wellness assessment and design of appropriate fitness/wellness programs. 8. Expose students to current literature in the area of physical fitness/wellness and lifestyle management. 9. Introduce students to measurement and evaluation in physical fitness/wellness. 10. Expand students’ understanding of the benefits and precautions in physical activity. 1. Plan and organize a physical fitness/wellness program. 2. Demonstrate proper techniques in exercise and fitness testing. This includes assessment of cardiorespiratory fitness, body composition, flexibility, musculoskeletal fitness, diet/nutrition, and stress. 3. 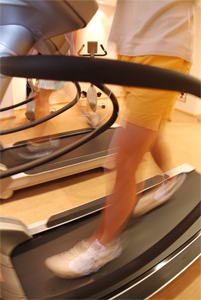 List and knowledgeably discuss the acute and chronic effects of physical activity. 4. Assess one’s physical and spiritual fitness and prescribe an individualized exercise prescription for both. 5. List books, articles, audio-visual aids, and other resource material currently available relating to physical fitness/wellness & lifestyle management. 6. Discuss intelligently the importance of proper nutrition to physical performance. 7. Use critical thinking to identify the benefits and precautions of physical activity to the following: heart disease, obesity, aging, and psychological health. 8. Prepare written and oral synopses demonstrating critical thinking from refereed journals on fitness/wellness lifestyle management. Four absences and 3 points will be deducted; five absences and five points will be deducted. Six absences will result in a letter grade lowered from your total points earned. Absences for university sponsored events are excused, providing documentation is given early to professor. § Perfect attendance will be rewarded by points added to the written exam. § All assignments must be typed. Mistakes in grammar, spelling, syntax, detract from your message and will negatively affect your grade. § No late papers will be accepted. It is the responsibility of the student to get assignments to the professor on time. Lee University is committed to the provision of reasonable accommodations for students with disabilities as defined in Section 504 of the Rehabilitation Act of 1973. Students who think they may qualify for these accommodations should notify their instructor immediately. Special services are provided through the Academic Support Program. As a Christian community of scholarship, we at Lee University are committed to the principles of truth and honesty in the academic endeavor. As faculty and students in this Christian community, we are called to present our academic work as an honest reflection of our abilities; we do not need to defraud members of the community by presenting others’ work as our own. Therefore, academic dishonesty is handled with serious consequences for two fundamental reasons: it is stealing – taking something that is not ours; it is also lying – pretending to be something it is not. In a Christian community, such pretence is not only unnecessary; it is also harmful to the individual and community as a whole. Cheating should have no place at a campus where Christ is King because God desires us to be truthful with each other concerning our academic abilities. Only with a truthful presentation of our knowledge can there be an honest evaluation of our abilities. To such integrity, we as a Christian academic community are called. Cooper, K. H. It’s Better to Believe. Nashville: Thomas Nelson, 1995. Fahey, T. D., Insel, P. M., Roth, W.T. Fit & Well: Core Concepts and Labs in Physical Fitness and Wellness. (7th ed.). Boston: McGraw-Hill, 2007. Floyd, P.A., Mimms, S.E., Yelding, C. Personal Health.(3rded.). Belmont: Wadsworth, 2003. Hales, D. An Invitation to Health. (10th ed. ).Belmont: Thompson Wadsworth, 2003. Hoeger, W. K., Hoeger, S.A. Lifetime Physical Fitness and Wellness. (7thed.). Belmont: Thomson Wadsworth, 2003. Pruitt, B.E., Stein, J.J. Decisions for Healthy Living. Boston: Pearson Benjamin Cummings, 2004. Tufts Wellness Newsletters. Tufts Medical Center. A. What is Body Composition?